First time for everything right? My latest oil pastel painting Lemon Gathering has a few firsts for me – 1st time painting lemons and a glass bowl. 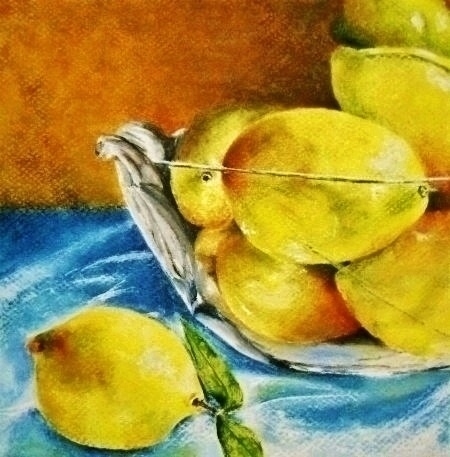 Lemon Gathering (8×8) was painted on Mi-Teintes cream tinted pastel paper using Sennelier oil pastels and several Holbeins. Look at a lemon long enough and a variety of colors begin to show themselves, so while the foundation of the lemons are yellow I decided to dramatize this piece a bit and intensify the colors. Brighter than what I normally paint, but it fit the vision I had for the painting. A wonderful photographer and artist, Lillian Bell from pmp, provided a beautiful photograph as the reference image for this painting – although used as inspiration, much was changed from the original source. This entry was posted in About Oil Pastels, OPs New Paintings and tagged glass bowl, lemons, Oil Pastel, painting. Bookmark the permalink. 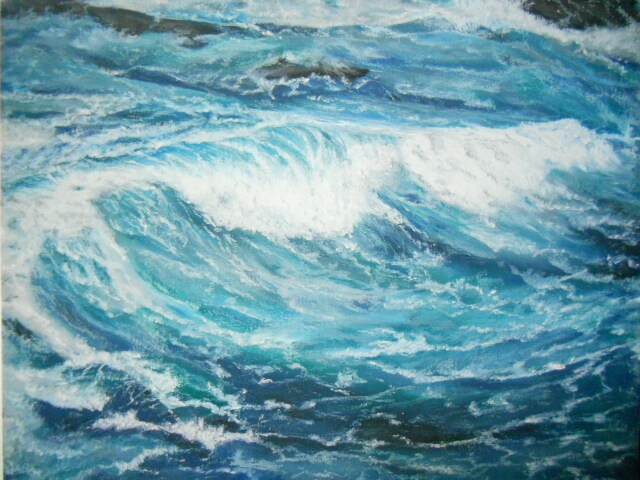 speaking from a little experience, painting glass is incredibly difficult. the reflections in the bowl are so perfectly detailed, and a nice compliment to the knobby lemons. bravo, Mary! Gorgeous, Mary! I love that touch of dark orange/brown on the lemons. Simply brilliant! Glass is endlessly fascinating…not only is it reflective, like metals and polished or wet objects, but it is transparent/translucent at the same time. Good job! Hi Cynthia, thanks – I agree how fascinating glass is, for me it’s also intimidating, so this painting gave me a good challenge and lesson. It was that old artist saying, paint what you see – not what you think is there. I had to keep reminding myself, that the surface was a smooth as silk and yet had all those qualities you mention, so that the end piece didn’t look choppy. Well, you’ve got both the lemons AND the glass:) I especially love the glass. Less is often more in rendering great glass, and you’ve got it! Thanks Elena. There were a few scrape downs with the glass – you are right, it was really easy to overdo it. I learned a lot about glass with this piece. Thank you Poppy – the sight of lemons do, don’t they? Thank you for mentioning the bowl, I learned a lot about painting glass with this piece because the reflections and glare are so different than a straight-lined vase. A wonderful splash of colour! Hi Jackie, thanks very much! Dorann, thank you so much – really appreciate hearing from you. The glass was interesting and I want to paint another soon to keep working on the technique. I just noticed yesterday for some reason my follow on your blog was shut off – can’t understand it, but I have been wondering why you weren’t posting to your blog (ha, little did I know). Oh, well done with the glass bowl. Lemons are lovely too, and, of course, I am always happy when I see blue anywhere. Thanks so much for your nice comments and noticing the glass bowl. The blue was chosen because the original had a cream colored tablecloth and I didn’t have that “ah” factor I was looking for – I love playing up blue. I think you did a fabulous job Mary! I love the color palette! Thanks Rhonda! More vibrant than my usual, but it seemed to fit – thanks again. Thank you Marina – appreciate your nice comment! Hope you are having a wonderful evening, the week is half-over. Love the contrasts and texture in this piece. Hi Lulu, thank you for your nice comments. I painted on the more-textured side of the pastel paper – hoping that the texture would work with the lemons. Thanks for mentioning! Thanks Eunice for mentioning the bowl that was the real test for me with this piece. Figures out it was all about values, and smooth-smooth patches of reflective colors. I should probably do several more crystal bowls and vases to gain more confidence. Wonderful job on these lemons. I love the bright colors. Isn’t it amazing when we really look at something and like you did with the lemons, see so many colors? I find that all the time I look, but I don’t see.